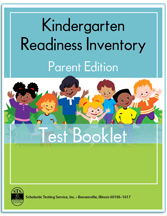 Kindergarten Readiness Inventory-Parent Edition , Scholastic Testing Service, Inc. The Kindergarten Readiness Inventory for parents is for home use only. Here parents can see where their child falls in learning areas for beginning kindergarten. Schools and professional educators see The Kindergarten Readiness Test (KRT) for multiple copies.